Honeyman State Park, also known as the Jessie M. Honeyman Memorial State Park, is the second largest Oregon State Park, covering 515 acres. Honeyman State Park was built by the Civilian Conservation Corps (C.C.C.) during the most difficult for America economic periods, the Great Depression. Originally named Woahink Lake State Park, later it was renamed to Jessie M. Honeyman Memorial State Park, honoring the Oregon Roadside Council President who was responsible for the preservation of natural areas along highways. The park was fully built in 1941 and has since been a major hotspot for Oregon residents and tourists looking for some bit of outdoor fun. The many structures, originally built by the C.C.C. including the Bathhouse, a few cooking shelters, the park caretaker's house and garage, are added to the National Register of Historic Places. Today, the park has 47 full hookup campsites (electricity, water, and sewer available), 187 tent campsites with water nearby, 121 electrical hookup campsites with water, 6 group tent campsites (each with picnic tables, fire pits and water), 10 yurts, biker/hiker camp, showers, restrooms, miles of hiking trails, picnic areas, meeting hall, and playground. The 2-mile long stretch of towering sand dunes separates the park from the shoreline of the Pacific Ocean. The park is the northern entry point of the Oregon Dunes National Recreation Area and features some of the highest dunes on the Northwest of America. There are no marked trails leading to the beach. Visitors may take a buggy tour of the park which is offered by many commercial operators near Honeyman Park. Alternatively, visitors can bring their own ATVs to get the full thrill of driving across the tall dunes. ATVs enter the sand dunes off the South Jetty Road that is north of the park. Also, from the beginning of October to the end of April, campers in H Loop are allowed to ride directly onto the dunes. Honeyman State Park has plenty of camping areas with different types of amenities to serve different needs. There are fire pits at all campsites, a huge playground for kids, RV and trailer hookups if needed, and warm showers. The best time to visit would be in the non-peak periods as it tends to get crowded during summer weekends. 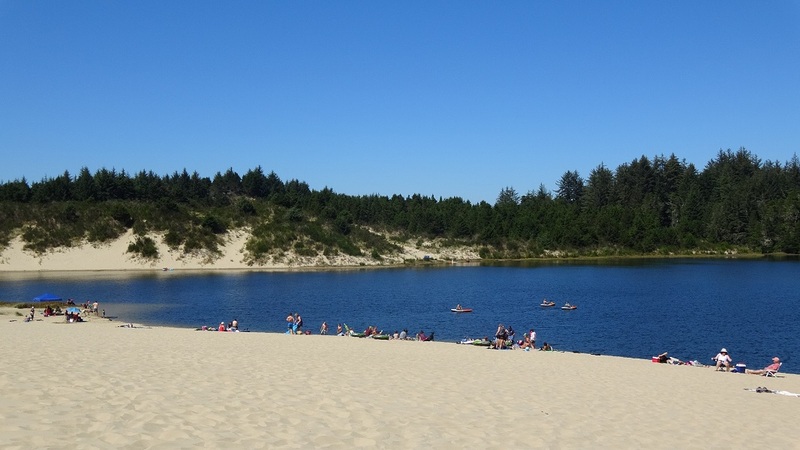 There are three freshwater lakes in Honeyman State Park: Cleawox, Woahink, and Lilly Lakes. Woahink Lake is the deepest lake damned by the sand dunes along the state of Oregon coastline and provides a great spot for fishing, swimming, boating, and kayaking. Cleawox Lake is also a swimmer's delight as well as a great canoeing and fishing spot for warm-water species such as the largemouth bass and the native cutthroat trout. If you don't feel like going in the water, there are picnic tables set up just beside the lakes where you can relax and enjoy the view. Activities: Camping, hiking, bicycling, fishing, swimming, and boating. There are plenty of natural, hiking and biking trails for those looking to break a sweat and explore the park more deeply. Visitors may also climb the dunes on foot which can be exciting, but the very tiring adventure. Sandboarding at the west edge of Clearwox lake is available year-round. Cautions. Dunes are unstable. Digging and tunneling in the sand dunes can be dangerous and even fatal. Honeyman State Park is a perfect destination for exploration of a unique coastal rainforest, dunes, and freshwater lakes. Many hiking trails in the park were developed by the C.C.C. in the 1930s. The one-mile trail connects Cleawox Lodge and the campground registration booth. The half-mile path links the Cleawox picnic area and campgrounds. Other trails provide connections between the day-use area and campground at Cleawox Lake and Woahink Lake. Cautions. It is not recommended to walk across the dunes to the ocean. There are no marked trails and the dunes are open to ATV operation. Whether you are going alone, with a friend or partner, with family, or as a group, Honeyman State Park offers plenty of exciting activities to do and a clean, comfortable, and safe environment to where you can relax and unwind. For Woahink Lake, turn left onto Canary Road and continue to the West Woahink Lake or East Woahink Lake Day-Use Areas on the right. Camping: 47 full-hookup sites, 121 electrical sites with water, 187 tent campsites, 10 yurts.